The Government of Alberta is proposing new legislation to deter impaired driving and improve safety on the province’s roads. 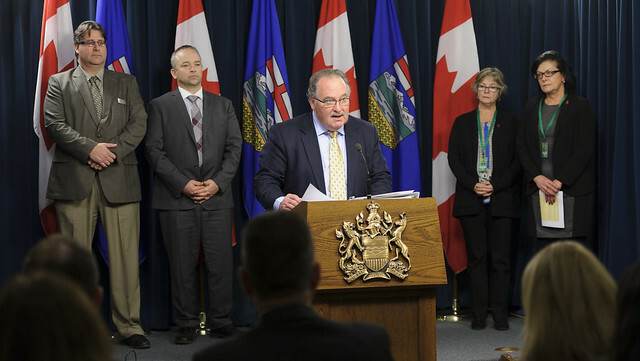 Minister Mason announces Bill 29, An Act to Reduce Cannabis and Alcohol-Impaired Driving, with representatives from Alberta Motor Transport Association and Mothers Against Drunk Driving. If the bill is passed, there would be new provincial sanctions for cannabis-impaired and cannabis/alcohol-impaired driving offences. The Government of Canada has introduced legislation that would legalize the use and possession of non-medical cannabis and make changes to federal impaired-driving laws in the Criminal Code. The proposed federal changes include three new impaired driving charges specific to cannabis, cannabis/alcohol combination and other drugs. Alberta proposes to update the Traffic Safety Act to reflect these changes and to ensure that sanctions for drug-impaired driving would be aligned with those already in place for alcohol-impaired drivers. The province is also responding to the recent Alberta Court of Appeal decision overturning section 88.1 of the Traffic Safety Act . Drivers who meet the criminal threshold for impaired driving would receive a 90-day licence suspension followed by one year in an ignition interlock program. The existing law imposed an indefinite licence suspension that stayed in place until the disposition of the court case. Expanded Zero Tolerance Program for Graduated Drivers Licencing drivers - in addition to zero tolerance for alcohol, there would be zero tolerance for cannabis, cannabis/alcohol combination and illegal drugs. Expanded provincial administrative sanctions for drivers with a blood drug concentration or blood drug/alcohol concentration over the new criminal limits proposed by the federal government. The sanctions would be the same as those imposed on drivers suspected of being criminally impaired by alcohol. A 90-day, fixed-term licence suspension for drivers found over federal criminal limits. Following the 90-day suspension, drivers would have the option to participate in a one-year ignition interlock program to have their licence reinstated. If they decide not to participate in the program, their licence would remain suspended for that year. In addition to these provincial sanctions, impaired driving can lead to criminal charges, which could ultimately result in additional suspension terms and interlock participation, fines and possible jail time. Over a 10-year period, from 2006 to 2015, 1,001 people died in Alberta as a result of alcohol or drug-impaired driving, and more than 15,000 people were injured. Mixing alcohol and drugs such as cannabis results in significantly increased impairment. In 2013 in Alberta, 24.1 per cent of fatally injured drivers tested positive in lab tests for both alcohol and drugs. If passed, the amendment related to 90-day licence suspension followed by one year of interlock would be implemented by Feb. 1, 2018. The cannabis-related amendments would be proclaimed and become law when the federal government has its legislation in place.